Third Eye Chakra - Intuition, Wisdom and Inspiration. Your Third Eye Chakra embodies your ability to expand your mental consciousness in many ways and forms. It is your connection to the wisdom the universe has to offer and is particularly recognized as the entry point of intuition and inspiration. The tone of intuition that is associated with your brow chakra differs quite substantially from the intuition of your solar plexus chakra. Your Solar Plexus guidance relates to assistance provided on daily, practical matters. The intuition of your third eye chakra is of a higher, more universal and transcendent nature, it provides you with insights relating to the spiritual significance of your life and Life itself. You can develop your intuitive skills into precise tools of perception. For example... just as a sighted person in a crowd of blind people would naturally have the advantage that sight brings, so would a person with an awakened third eye of the soul have the advantage of all-round vision. Envisage yourself having greater awareness of auras and chakras, imagine connecting to your spirit guides with ease and intuitively knowing your path forward. Through the experiences you'll have, you'll gain knowledge, and through that knowledge you'll gain perspective. An open and balanced brow chakra enables you to separate the real from the imagined, the vital from the unimportant and it allows you to become intuitive, optimistic, and knowing. An open Third Eye Chakra enlightens every aspect of your life allowing an understanding of the relationship between the physical, emotional, and intellectual. You can learn how to open and balance this very important chakra and by knowing the truth of all your processes, your life experiences ring more true. The third eye or "Ajna" chakra is located at the brow, at the junction of the ida, pingala and sushumna meridians. The ida and pingala ends at this junction while the sushumna rises to the crown. The merging of the three energies brings extraordinary gifts once awakened. The Sanskrit name "Ajna" meaning "to know" refers to aspects of telepathy and other means of direct knowing which bypass the ordinary senses. Rouse your foresight, intuition, and clairvoyance learn how you can awaken and open your Brow Chakra! I have recently launched the Chakra Bundle Charts (11 different chakra charts) for your enjoyment. Located at the middle of forehead just above eyebrows. Ajna meaning "to know", "to perceive" or "to command". Direct perception, intuition, wisdom, insight, imagination, spiritual awareness, vision, individual consciousness. Archangel Gabriel and Archangel Jophiel. Two hemispheres of the brain. Eyes, base of skull, hypothalamus, endocrine system, head, face. Indigo or violet- uncover the full spectrum of Healing with Color. Lapis Lazuli, Azurite, Sodalite, Larimar, Amethyst, Sugilite - to learn more about Crystal Healing see "The Power of Quartz - A Course in Healing with Crystals. Meditate, lie down with a crystal or a small pyramid on your forehead and visualize an indigo blue flame. Any visual activity such as coloring or drawing. Click here for Third Eye Chakra Affirmation to be repeated 15 times once or twice a day. 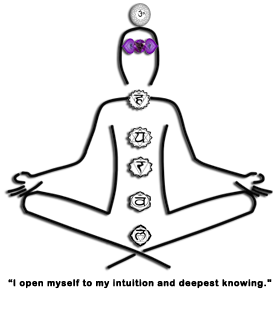 Activate and balance your lower chakras first because premature awakening of your brow chakra will cause great confusion in your life.